The street art project to restyle the chimney of the Branca factory in Via Resegone came about as the result of a partnership between Orticanoodles and Fratelli Branca Distillerie. 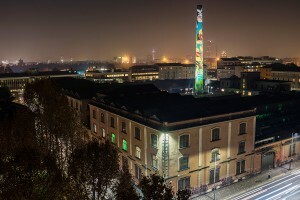 The historic Milanese company was keen to put the spotlight on the distillery chimney, an almost forgotten feature of the urban landscape before the mural was painted onto it. The project itself was inspired by the history of Fratelli Branca Distillerie, an Italian company with a history dating back 170 years, documented in its entirety thanks to the Branca Museum and the publications it has produced over the years. In keeping with company tradition, the painting of the chimney reflects the company’s motto “Novare Serbando” (“renew while preserving”). Orticanoodles has achieved both aims: the artists have renovated the chimney, which dates back to the early twentieth century, while preserving its original shape and its links with the local area. 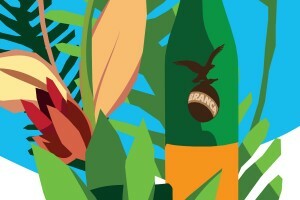 For Orticanoodles, the mural, one of the highest in Europe, is a reflection of the laborious and skillful process by which the famous Fernet-Branca liqueur is produced: a brightly-coloured tangle of intertwined herbs, climbing upwards towards the skies of Milan, interwoven with historic bottles and icons that tell the story of the company: the globe with the eagle atop it, and the smirking crocodile from the posters of the 1920s. The herbs create a play of shapes and colours which can best be seen from a distance of hundreds of metres. Orticanoodles took approximately 10 days to create the mural, painted using the “spolvero” (soot) technique, a feature of Michelangelo’s art back in 1500.
family who had been an integral part of this work of art by helping to paint the mural were invited to put their signature on the roots painted at the base of the chimney, symbolising in some way the company’s origins and its history. The company’s decision to use the artistic channel of steet art is undoubtedly based on its desire to reach as many people as possible using a form of expression that would be capable of telling the story of Branca through images. Keeping the original construction of the Chimney, the balance of shapes, innovation and contemporary style converse with the territory. bright and vibrant colours visible both by day and night. In fact, thanks to Branca’s collaboration with Futuro Luce, the chimney is resplendent at night thanks to a led lighting system and cutting edge technology, all in keeping with the company’s traditional values of excellence, elegance and contemporary Milanese art. them into projects with huge added value in all the sectors in which it operates: residential, offices, museums, artistic, architectural, hospitality and wellbeing/leisure. Flexibility, simplicity, innovation and design are the cornerstones of the company’s philosophy, enabling it to find smart solutions for all those situtations where lighting is the distinctive and essential element defining the space. The company’s interest in culture, in a broad sense, gives it a strong impetus to engaging in important collaborations to design and develop projects of excellence which combine the values of Italian art and tradition with technology and energy conservation.